Below you’ll find Brisbane solar power installers that are in the SolarQuotes network of pre-vetted Queensland companies. 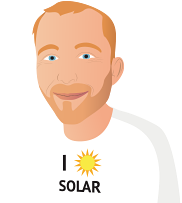 To get free solar panel quotes from 3 of these quality Brisbane installers, simply pop your postcode in the box on this page and press the big red button and we’ll get to work immediately on organising those no-obligation quotes for you. Perhaps more than any state capital, the city of Brisbane in Queensland has in the past been subject to the “slash and burn” strategy of a state government seemingly determined to airbrush out all evidence of solar power in favour of fossil fuel based energy. No sooner had Campbell Newman rested his bottom on the Premier’s chair after his party’s convincing win in the Queensland election of March 2012 than he started wielding the axe. Out went the generous feed-in tariff and support for solar energy installations. The then-Premier also threatened to pull the plug on state/federal PV projects in the state. Did the attitude of the government of the day discourage the forward-thinking citizens of Brisbane? The answer is a resounding “no” as Brisbane’s residents rolled their sleeves up and continued to support important renewable energy technologies such as solar power – and financially benefited by slashing their energy costs. Thankfully, in the post-Newman era, Queensland’s government recognised the importance of a renewable energy powered future, setting a target of one million solar rooftop installations or 3,000 megawatts of total PV capacity installed across the state by 2020; a goal it looks set to achieve. Brisbane has survived a number of major tragedies such as flooding in recent years. These freak weather patterns have been linked by some to climate change due to carbon emissions produced by the burning of fossil fuel. Perhaps Brisbane folk know better than others the need to convert to renewable sources such as solar energy. The passion demonstrated by Brisbane residents for installing solar panels has been a driving force in Queensland evolving into the nation’s leading state in terms of the overall number of solar power systems installed. Each kilowatt of PV panels installed in Brisbane will generate on average 4.2 kilowatt-hours of electricity a day. As at the end of October 2018, more than 586,157 households throughout Brisbane and Queensland (32.6% of all dwellings) have harnessed the sun’s energy by installing solar panels; taking more control over their electricity costs. This represents the highest rate of PV saturation in Australia. You can join Brisbane’s rooftop revolution. Get on the road to serious power bill savings today by submitting your details for quotes from trusted Brisbane solar installers!